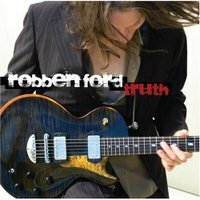 My review of the new Robben Ford album Truth has been posted at Modern Guitars Magazine. UPDATE 8/13/07: I've republished my review below. Jazz/blues guitar legend Robben Ford's latest album Truth (Concord Records) features a set of sophisticated blues songs that really shows his strength as a songwriter. Though much of his early work was in the jazz and fusion genre's, Ford only takes occasional trips into that realm nowadays (e.g., with Jing Chi). The main focus of his solo albums has almost always been the blues; that's certainly the case with Truth. Whether it's the trials and tribulations of the 9-to-5 grind ("Lateral Climb"), a tribute to a musical icon ("Riley B King", co-written with Keb' Mo' as an homage to B.B. King), or even an anti-war message ("Peace On My Mind"), Ford's common denominator on this album is the blues. As a guitarist, the part of Ford's playing that has always struck me is his touch. His phrases have a very mature, dynamic feel to them that is instantly recognizable. The guy sounds like he's been playing for a hundred years. And his tone has that enviable strong-yet-clean quality that most players in this genre strive for. There's a dry, natural punchiness to his sound that really allows the nuances of his touch come through. Even though Truth's focus is the songwriting, and the stories Ford wants to tell, there are many guitar highlights on this album. Ford's soloing here is obviously blues-based, but his jazz chops pop up now and then as well. The "jazziest" guitar lines on the album are on "How Deep In The Blues (Do You Want To Go)". This is a sophisticated blues song with some nice changes that give Ford a chance to stretch out a bit harmonically. Ford's cover of the Otis Redding song "Nobody's Fault But Mine" features some great playing also. This track has a fun, live feel to it, especially near the end (the only other cover on the album is a shuffling, funky version of Paul Simon's "One Man's Ceiling Is Another Man's Floor" with guest vocalist Susan Tedeschi ). "You're Gonna Need A Friend" really stands out as well. Co-written with Ford's wife, Anne Kerry Ford, this track features great backing vocals courtesy of Siedah Garrett, and some cool changes for the solo section. The most "guitar-heavy" song on Truth is probably "Too Much" (written by Ford's nephew Gabriel Ford). This is a deliberate, grinding tune that ends with some nice interplay between Ford and Larry Goldings on the Hammond B3 organ. The excellent Live In Tokyo album that Larry Carlton recorded with Ford last fall includes a great live version of this song. The strong minor blues cut "Moonchild Blues" is another highlight. The kind of lines Ford plays here are what sets him apart as a guitarist and improviser. Within the blues genre, there aren't many players who can whip out the cool jazz lines Ford uses in this song. He turns what could have been a standard minor blues into something hipper and more mature. In all, Truth is a fine collection of contemporary blues songs. Aided by a stellar cast of guest musicians and co-writers, Ford has succeeded in crafting a fresh-sounding album, within the framework of an age-old musical style. This is also the case from a blues guitar standpoint. Ford's jazz vocabulary adds a sophistication to his blues playing that few players can match. His solos here are always tasty, inventive, and highly enjoyable. The same could be said for the album as a whole.